Welcome to the HUKDgaming News Round-up Thread – a place to get caught up on the on-goings of the industry. Every weekday at 5pm we’ll update the OP with the latest video games news from around the internet, as well as a heads-up on what’s going on in the forums here so you’re always up to date. Don’t forget: You can subscribe to threads so you’re notified when new comments and updates have been posted! Did anything take your fancy? Did the sight of Yves Guillemot & Shigeru Miyamoto with pretend guns excite you? Not fussed? Jump into the hotukdeals.com/tag…668 and have you say. Did anything take your fancy? Excited or underwhelmed by it all? Let us know in the hotukdeals.com/tag…857 where the reactions are still coming in from the community. The only other big name to show their wares at this year’s E3 is Nintendo, who are showing off Super Mario Odyssey and “new details for Nintendo Switch games launching this year.” Expect news on Xenoblade Chronicles 2, Fire Emblem Warriors, and hopefully a few surprises if we’re lucky. It all kicks off at 5pm BST, but if you’re reading this after the fact you can click the link above and watch a replay by going to the videos tab. Some 20 years after it originally released, Microsoft are remastering the classic RTS title Age of Empires. The Definitive Edition features gameplay improvements with a modernised UI, re-recorded soundtrack, 4K resolution, and online multiplayer. Firaxis are calling War of the Chosen a massive expansion to XCOM 2, as it brings three new factions to recruit in a campaign that is bigger than the main game. Here’s the latest gameplay trailer for the medieval RPG title, showing off the improved mounted combat in action. It isn’t long now until the second part of the Total War: Warhammer trilogy is here, so CA have released a first look at the kinds of epic battles players can send their armies into when it releases in September. And that’s your lot for today, and for this thread as I’m heading on to pastures new! Thanks to those who took the time to read, but don’t forget that the chatter continues in community threads below! And that’s your lot for today. We’ll be back tomorrow with more but in the … And that’s your lot for today. We’ll be back tomorrow with more but in the meantime do be sure to hit the threads if anything here has piqued your interest! Is this going to be a daily occurrence, weekly, monthly, or on an ad hoc basis, Carl? If daily then, after a fortnight, the "Misc" Forum [Discussed] page may be completely full of gaming threads! ...Injustice 2: Cheetah trailerThe latest trailer for Injustice 2 gives … ...Injustice 2: Cheetah trailerThe latest trailer for Injustice 2 gives us our first look at Cheetah, who was confirmed as part of the roster last month. There’s plenty of clawing and kicking going on, as Cheetah tears up the Amazonian princess, Robin, and Deadshot in the latest gameplay trailer. Damian Wayne... with a sword! I'm still waiting for any other retailer (other than ShopTo.net) to offer the "Injustice 2" Ultimate Edition Steelbook for pre-order. Like you say it's a slow news day but checking the first post daily will work for me, you going to somehow archive the old posts? Or knock off the old stuff after a few days and just keep a few days worth in the first post? I like this idea. Interesting how Wildlands has sold well as I played the beta and it was just so janky and repetitive. I like this idea. Interesting how Wildlands has sold well as I played the … I like this idea. Interesting how Wildlands has sold well as I played the beta and it was just so janky and repetitive. The updates will be daily, but I should point out that I won't be setting up new threads. Instead I'll be updating the OP and archiving previous days in the comments below (which should also answer your question, joanddan7!) That way we're keeping the threads as tidy as possible, and conversation can flow into existing topics (as shown above.) It should make more sense when I update the OP this afternoon! I share this opinion. I had such high hopes for Wildlands too, but despite finding it slightly fun with a few friends we all agreed it wasn't worth jumping in a launch for. I may bite once it drops in price, but with the first quarter of the year having some many great games (which I still haven't played ) I've got other games higher on my hit list. What a great idea! Nice to see the big news all in one place. Cheers for putting me into one of them. Here's another two if they interest you. Xbox Adds New Speech-To-Text Feature, But Only For One Game - Game Chat Transcription is rolling out now for Halo Wars 2. I probably won't feature the ones you've linked because they're a few days old (and I want to focus on the latest stuff in the daily posts) but do keep be sure to throw them in the respective platform threads! That Xbox Speech-To-Text feature is particularly awesome stuff, as it could help Microsoft with their Play Anywhere initiative between XO and PC if it works as intended. Even though sales have dropped 73%, Ubisoft’s open-world shooter Ghost Recon: Wildlands has managed to remain at the top of the UK sales charts this week. Meanwhile, Lego Worlds has managed to leapfrog Horizon: Zero Dawn for 2nd place, and GTA V, FIFA 17, and Rocket League continue to hold their own in the face of recent releases. The Legend of Zelda: Breath of the Wild drops a few places this week, becoming the only Switch title to remain in the top 10. Elsewhere, a number of Xbox one titles such as Forza Motorsport 5 and Rare Replay have returned to the charts thanks to a number of hardware bundles deals popping up. Nintendo have announced that Android owners will be able to get their hands on Super Mario Run from March 23rd. It will also mark the release of Version 2.0, which will come to both Android and iOS, which sees the addition of new playable characters. If the current temperature of this deal is anything to go by, it appears the community still isn’t enthused by the £9.99 price tag. That said, don’t forget you can try the first few levels of the auto-running platformer for yourself before you put down any money by simply download the app from your smartphone's respective app store. Over the weekend, BioWare general manager Aaryn Flynn used the studio’s official Twitter feed to respond to the recent harassment of former EA employee Allie Rose-Marie. Having been accused of being responsible for the animation issues within Mass Effect: Andromeda, Flynn stated that the “reports were false” before adding that attacking individuals, regardless of their involvement in the project, is never acceptable." The first wave of press reviews landed this morning, and opinion currently lands between average and good. The animations and writing have been the main criticisms, but the combat, exploration, and multiplayer have proven to be popular, with some critics claiming things click further into the game. We’ve already seen chatter on the forums of people cancelling pre-orders on the back of the EA Access demo, but have you been swayed by today’s reviews? Perhaps you’re ignoring them entirely and are still looking forward to it? Get on the forums and get the chatter going! The PlayStation EU blog has posted some fresh info on the upcoming spin-off in the Uncharted series. Topics covered include how the setting of India will inject “a fresh surge of colour and personality”, and why Chloe Frazer and Nadine Ross were chosen as the co-leads. There’s also mention of “the biggest [area] ever for an Uncharted game” in which are littered with puzzles, traversal challenges, and plenty of treasure to find. Excited by the new details? Still not convinced? Head over to the PS4 News Thread and let the community know! Dead Rising fans will be seeing Frank West in a new light come April 11th, as Microsoft have announced the Frank Rising DLC. Part of the Season Pass (or £7.99 on its own), it sees Frank infected with the undead virus, an unfortunate turn of events that gives him new abilities. It also means he needs to feed to survive, which should mix things up a little in the zombie-killing sandbox. Excited to eat some brains for once instead of smashing them? Let us know over in the Xbox One Thread! Don’t forget to join in the discussion on Breath of the Wild over in the HUKD Nintendo Switch owners thread and The great big HUKD Nintendo thread. The most unlikely game ever continues to expand on PS4, and this time the goat’s going to space. The new trailer is the usual mix of pop culture references and animal-based ridiculousness ahead of the DLC’s release tomorrow on PS4. The SimLife meets Minecraft title Birthdays The Beginning has a new developer interview video out in the wild. In it, creator Yasuhiro Wada (of Harvest Moon fame) talks about the various ways players will be able to bring new life to your cube islands, as well as challenge mode scenarios that will be available outside of the sandbox story campaign. The latest trailer for Injustice 2 gives us our first look at Cheetah, who was confirmed as part of the roster last month. There’s plenty of clawing and kicking going on, as Cheetah tears up the Amazonian princess, Robin, and Deadshot in the latest gameplay trailer. How will people know you have updated this if it does not appear in the … How will people know you have updated this if it does not appear in the new section? Seems like the majority of people won't know this thread even exists! I do think it is a good idea but unless it is pinned to the top or highlighted on the main page I think it will just get lost along with everything else. I also think this is a problem with the Xbox, PlayStation and Nintendo threads that the majority of people do not know they exist. That's a good point. I'll have a word with the powers-that-be and see how they want to go about this (as I know there is concern about sticking threads in Misc.) I'll keep you posted at any rate! That Classic FM programme sounds good. Nintendo announced the Fire Emblem Echoes: Shadows of Valentia (3DS) Limited Edition is going to be released May 19th Link to the article. The video's in there but it's also on their youtube page linky here. I've been checking around and couldn't find any listings yet (except for gamestop.com at $59.99). Might be one to keep on eye out for if last year's Fire Emblem Fates Special Edition is anything to go by. It comes with the game, an artbook, metal pixel pin badges of Alm, Celica, and Marth, a double-sided titlesheet, the “Sounds of Echoes” soundtrack selection CD, and Alm and Celica amiibo. Can we confirm... unless am I being stupid and missing them... the Switch, Xbox and ps4 threads have all been deleted???? So having spoken with the powers-that-be, the best solution to ensure you don't miss any threads you're interested in is to use the Subscribe and / or "Save Misc Thread" function at the bottom of the OP. Hope that info helps those wanting to stay up to speed! Bandai Namco kicked off the morning by announcing that Digimon Story Cyber Sleuth would be getting another instalment next year. Hacker’s Memory takes place during the same time frame as the original Cyber Sleuth game, as new protagonist Keisuke Amazawa attempts to uncover the truth behind the mysteries that exist between the real and digital worlds. Screenshots for the upcoming game can be found over in the PS4 thread (found by CoolDude0123) so be sure to check them out. Details for the next big patch for Dark Souls III were thrown up on the official sub-reddit this morning, ahead of the release for The Ringed City DLC. Along with the usual weapon balance fixes, users spotted that there will be “increased frame rate for gameplay on PlayStation 4 Pro.” While this detail is somewhat vague, the official twitter account did confirm that it will be “variable FPS”, so don’t go expecting 60 frames per second as invading phantoms come to murder you. The team behind the Megami Tensei and Persona games have announced that they will be hosting an event online this Saturday. The “Atlus New Title” Announcement Special Spring 2017” live stream has a title that is incredibly self-explanatory, we expect something on the Shin Megami Tensei title for the Switch, along with more details on the recently announced Radiant Historia: Perfect Chronology for 3DS. The event kicks off at 11:00 BST, but we suggest you brush up on your Japanese before then if you’re planning on watching this one. Although BioWare had previously stated there wouldn’t be any need for a Day One patch (claiming it was part of the launch day build) a patch will be awaiting players when they install the game on all platforms. The PC version will get fixes for missing sound in MP and black screen issues, but console version patch notes weren’t as forthcoming, only mentioning “various improvements and bug fixes. The debate over yesterday’s critic scores is in full swing over in the Mass Effect: Andromeda reviews thread, so be sure to drop by and get involved. In a rather short but sweet reply on the Battle.net forums, Overwatch game director Jeff Kaplan confirmed that Blizzard are currently working on a way to export Play Of The Game highlights out of team-based shooter Overwatch, and that it will arrive in time for summer. This will be music to the ears of fans who have needed to use external capture solutions to show off their moments of glory. Meanwhile, the newest hero Orisa will be added to the game this evening when the latest patch goes live. Blizzard have confirmed that the new tank character won’t be available in competitive mode for at least a week, a move to ensure all players can get used to her abilities (and weaknesses) before trying to climb those rankings. Microsoft are gearing up for a big Project Scorpio reveal at this year’s E3, but this afternoon they revealed their new Tech series of wireless controllers. The Recon Tech controller was apparently inspired by “military technology and performance patterns,” resulting in premium finishes such as “laser etched texture on the front” and “textured diamond rubberized grip” on the back. It also takes advantage of custom button-mapping via the Xbox Accessories App, as well as the new Copilot feature which allows two controllers to act as one. It launches worldwide on April 25th at a $69.99 price tag. We’ll update this article with a UK price as soon as it appears. If you’re looking forward to the new controller for your current Xbox, PC or future Scorpio purchase, let the community know by heading to the Xbox One thread. Having announced that the first UK radio show dedicated to video game music was on its way, today Classic FM announced that High Score will be kicking off on Saturday 22nd April at 9pm. Hosted by Jessica Curry – who won a BAFTA for her soundtrack to Everbody’s Gone To The Rapture – the hour-long program will run for six weeks and will focus on a different theme each episode. What’s your favourite video game soundtrack? Start a thread and get those musical opinions flowing! In another example of older games hiding secrets, a prominent Street Fighter player known as Desk has discovered combo attacks in Street Fighter II: World Warrior (the arcade version of the title) that have allegedly never been seen before. The meat of the theory is explained in the description of the video, but the gist of it is that an exploit that only Vega should have been able to use – performing a combo after a knockdown – is technically possible with every character in the game. This led to Desk going on a month-long investigation to see what else he could do, including double jump-ins and double fireballs. It’s interesting stuff if you’re a fan of the classic fighting game. 2K Games have unveiled the next civilization to be added to its strategy series – Persia. The video details how the Persian empire will be ideal for players who like to make money and launch surprise wars upon their enemies. This is thanks to leader Cyrus II’s special ability that provides bonus movement upon after a surprise declaration, and the Immortal swordsman unit that includes a ranged attack makes them a formidable opponent. Fallout VR sounds interesting might sway me into buying a PS4. Thanks for the gaming news OP very informative. Fallout VR sounds interesting might sway me into buying a PS4. Thanks for … Fallout VR sounds interesting might sway me into buying a PS4. Thanks for the gaming news OP very informative. This morning Inbetween Games – a trio of developers formerly from Yager – launched their Kickstarter campaign for their game All Wall Must Fall. Taking inspiration from titles like XCOM, The Banner Saga, and Braid for its gameplay, the self-described “tech-noir tactics game” takes place in an alternative future Berlin where the Cold War never ended. I highly recommend checking out their pitch video, which shows the gameplay in motion and demonstrates how the music blends into the action. Although the day-one patch for Mass Effect: Andromeda has now been detailed with fixes like improvements to cinematics and quests, lead designer Ian S.Frazier has confirmed on Twitter that BioWare are “looking at patching lots of issues and want to strongly support the game moving forward.” While stopped short of getting specific, it’s not hard to guess that he’s referring to the many animation problems that were brought to light during the Early Access demo that was released last week. With the game landing tomorrow (and certain retailers sending copies out early) be sure to let the community know what your thoughts are on Mass Effect: Andromeda in the community review thread! After revealing Fallout 4 VR was a real thing during the Bethesda E3 press conference last year, vice president Pete Hines has confirmed that we will get our first look during this year’s event. The confirmation came during an interview with YouTuber Hip Hop Gamer, going as far as saying that “It is going to blow your mind. It is the craziest thing you’ve ever seen.” I guess we’ll find out for sure in June! Having missed being a PSVR launch title, Fated: The Silent Oath will make its long-awaited appearance on the PlayStation platform on March 28th. The news was confirmed over on the official Twitter feed, almost a year after it initially released on PC. Featuring a colourful, cartoon-like art style, and gameplay that mixes puzzle-solving with exploration and character interaction, it tells the tale of Viking who is trying to protect his family from mythical creatures. There’s no word on pricing just yet, though. European iOS and Android users will finally be able to download the free-to-play mobile spin-off title Yo-Kai Watch Wibble Wobble at the end of the month. The match-em-up battle gameplay turns the Yo-Kai creatures into cute drip creatures called Wib Wob, and it’s up to players to befriend them by defeating them. Having reached over 10 million downloads worldwide since it debuted last year, critics have praised the gameplay and art style. Those of you still killing your smartphone batteries by catching ‘em all will be pleased to know that a new in-game event kicks off at 8pm this evening. From then until March 29th, players will find more water-based Pokemon like Magikarp and Squirtle on their travels, as well as chance to run into a wild Lapras. GOG.com’s Galaxy gaming client will soon be leaving its beta phase and officially launching. Version 1.2 will mark this huge milestone with the addition of Cloud Saves for all titles. While this doesn’t initially sound that impressive, GOG have pointed out that this includes older games that have never had such support before (Planescape: Torment, for example.) Other improvements include a hibernation mode, bandwidth limiting and scheduling, screenshot capturing, and a new in-game overlay. While the official launch date is currently in April, users can opt in to test Version 1.2 in the GOG Galaxy settings. RUMOUR: Gran Turismo Sport coming in April? It’s pinch-of-salt time, folks. Reports have emerged of a Finnish retailer updating their listing for Gran Turismo Sport (under the title of Gran Turismo 7) with the release date of April 20th 2017. This could be a placeholder date or ambitious guesswork, but considering the Closed Beta is currently underway there’s always a chance of there being a hint of truth to it all. Either way, we’ll keep you posted if more details emerge. In the meantime, be sure to dive into the PS4 thread to discuss if you think the rumour is true or a bunch of baloney. Although you run the risk of getting the classic theme song stuck in your head, Daytona USA is now playable on Xbox One. It’s joined by Stacking and Tower Bloxx Deluxe as the latest additions to the Xbox One Backwards Compatibility list, so if you already own them digitally or still have the original disc you can revisit these older titles right now. Out of nowhere, Ghostbusters: Now Hiring has appeared for PSVR. Taking the role of the new recruit, players are charged with capturing Slimer as he runs amok around the iconic Firehouse HQ. While this all sounds great, it should be pointed out that the experience is only around 10 minutes long, and the current US price is $6.99. Hopefully later episodes will be a little more substantial. Discussion on the VR experience (or lack there of) is taking place over in the PSVR thread, so be sure to drop by and join in. White Paper Games, the team behind Ether One, have announced their next game. The Occupation revolves around a whistleblowing journalist in 1980’s England, whose actions (in real-time) affect the outcome of a politically charged storyline. There’s no confirmed release date, but expect it to arrive later this year. With the closed beta beginning in the near future, Bethesda have released a new trailer showing off another of the arenas players will be fighting in free-to-play shooter Quake Champions. The trailer shows off lava pits, gothic hallways, and plenty of rockets (some combined with jumps.) You can head over to the official website to sign up for the closed beta if that’s put you in an old-school shooter mood. I missed this yesterday (ugh) but Nintendo released a video showing off what will be inside the Limited Edition of Fire Emblem Echoes: Shadows of Valentia when it releases on May 19th. Along with the game you’ll get an artbook, three metal pin badges, a soundtrack selection CD, and two amiibos. And that’s your lot for today. We’ll be back tomorrow with more but in the meantime do be sure to hit the threads if anything here has piqued your interest! Agreed. This thread needs to be pinned to the top. Every time this thread is updated there's a new comment with the archive of the previous update so it effectively gets bumped everyday anyway - it just doesn't seem to be very popular yet. Thread is worthless without Bloodborne 2 announcements. I think this is great! I don't look at gaming news. That is what I was thinking although fans of Warhammer are quick to point … That is what I was thinking although fans of Warhammer are quick to point out that the Aztec/Maya counterpart in the Warhammer world are the Lizardmen. So possibly a continuation of the previous game? I kind of doubt that somehow, would be disappointing for the history buffs and too soon? I was really looking forward to the Warhammer one but I wasn't crazy on it, admittedly haven't played many hours. It's most likely as this thread offers very little, its a bunch of links … It's most likely as this thread offers very little, its a bunch of links picked out by some guy, who never used misc prior to starting this thread, the other gaming threads are as busy as usual, maybe we should pin them to the top? It doesn't really seem to make much sense as at least if someone starts a thread about a bit of gaming news then they have something to say about it & are generally ready to take part in the discussion. This is just a list of links by a random. I used to love the Total War games back when I had a gaming PC but I … I used to love the Total War games back when I had a gaming PC but I think the last one I played was Medieval II: Total War - Kingdoms Expansion Pack. I know this is going back some years but this included Aztec and Native American factions set in the New World. I guess they could revisit that period again but a few months back they mentioned the next game would be something they have never did before. I guess we will find out 7 days from now, not too long to wait! The current theory on the official reddit is that it's going to another Warhammer-based game, this time set in the Lustrian Empire. While I wouldn't say that matches the whole "never done before" comment, Warhammer: Total War (which should have been called Total Warhammer, let's be honest) was the fastest-selling entry in the series so I wouldn't blame TCA from trying to build on that success. The current theory on the official reddit is that it's going to another … The current theory on the official reddit is that it's going to another Warhammer-based game, this time set in the Lustrian Empire. While I wouldn't say that matches the whole "never done before" comment, Warhammer: Total War (which should have been called Total Warhammer, let's be honest) was the fastest-selling entry in the series so I wouldn't blame TCA from trying to build on that success. Salt & sanctuary - Vita version out on the 28th march. It is cross buy as well. You're absolutely right - they are doing a trilogy's worth of content that, as you say, can be bolted on or as a standalone purchase. Chances are that's what they meant by something they had "never done before." You're absolutely right - they are doing a trilogy's worth of content … You're absolutely right - they are doing a trilogy's worth of content that, as you say, can be bolted on or as a standalone purchase. Chances are that's what they meant by something they had "never done before." It’s a topic that has been ongoing in our Switch Owners Thread on the forums, but Nintendo have finally confirmed there’s something causing the Joy-Con controllers to de-sync from the console. Anyone who is suffering from these issues can get in touch with Nintendo Support for the fix to be done free of charge. Nintendo have also promised that it won’t affect future shipments of the device, as the issue has been fixed at a factory level. Community member Moonwolf1976 has started a thread specifically about the news, so be sure to head over and join in the conversation! The Xbox Austria team have jumped the gun by announcing the Games With Gold line-up for April. The image tweeted confirmed that Ryse: Son of Rome (XO) and Darksiders (X360) will kick off the month, with The Walking Dead Season 2 (XO) and Assassin’s Creed: Revelations (X360) arriving on the 16th. We expect an official announcement to appear in the next future, but in the meantime you can head over to the hotukdeals.com/mis…%20 on our forums to let the community know if you plan to pick any of the up! The first sighting of Destiny 2 promotional material was spotted in the wild early today. Posted over on NeoGAF, the poster shows three characters – all humans and without helms, curiously – standing with familiar looking weaponry and armour. Of course, the juicy details from the image are confirmation of a September 8th release date, and the familiar sight of a “PlayStation Exclusive Content” tag in the top corner. There’s also mention of a beta at the bottom, which will most likely be linked to pre-orders. 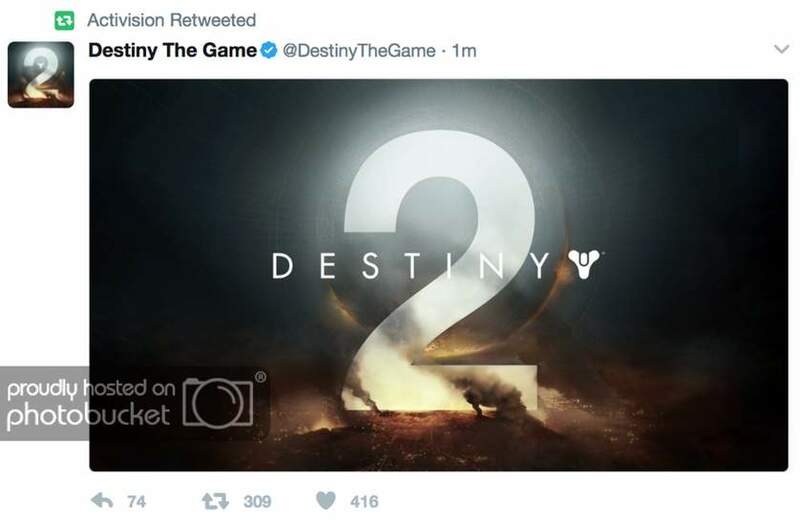 Kotaku claim the image is legit and that Bungie are going to make an official announcement later today. There will no doubt be a big blowout of details come E3, but in the meantime take the forums to discuss the leak! After a three month wait, the third episode of the The Walking Dead Season 3 will be releasing on March 28th. The news was announced via Telltale’s twitter account and includes a (relatively) spoiler-filled trailer. If you’re a PS4 owner who hasn’t had chance to check out Titanfall 2 yet, listen up. Another free weekend will be taking place from March 30th until April 3rd, giving full access to the multiplayer suite. There’ll be some single player content too with the Training Gauntlet and The Beacon mission will be available to try. The Free Weekend will also mark the release of the Colony Reborn DLC - which will be free to all players – bringing a new map, a new weapon, two new Prime Titans and a Curb Check execution. Tempted to give it a go? Let us know in the PS4 thread! More grand strategy is on the way from the folks at The Creative Assembly. A countdown page has appeared over on the Total War website, with the timer set to run out at 4pm next Friday. The background image shows an aerial view of a misty forest, with what looks like a temple in the background. Got any theories on which period (or IP) will be covered next? Sound off on the forums! New World Interactive, the team behind tactical multiplayer shooter Insurgence, is finally bringing their latest title out of Early Access. Day of Infamy offers a WWII shooter experience with a focus on teamwork within its multiplayer and co-op modes. Pre-release impressions have been largely positive, stating the gameplay finds the fine line between Red Orchestra and Day of Defeat. It currently costs £14.99 on Steam. With just over a week to go until its release, a new Kingdom Hearts HD trailer shows off highlights from throughout the series. Effectively four games and two in-game cinematic films, 1.5 + 2.5 ReMix contains most of the series in one compilation. The latest trailer for the upcoming Prey reboot focuses on the main character of Morgan Yu. The team at Arkane Studios explain why players will be able to choose the gender of the protagonist, as well how choices will impact the overall game. ...Bulletstorm: Full Clip Edition Launch TrailersWith two weeks to go … ...Bulletstorm: Full Clip Edition Launch TrailersWith two weeks to go until the remastered version of Bulletstorm arrives, a new trailer has been released to showing the over-the-top FPS gameplay with the improved visuals. The Full Clip Edition comes with all of the DLC, and pre-orders can even replace the main character with a certain Duke Nukem, complete with voice acting from John St. John. Has the on-screen "skill shot" (point-allocation/description) text from the previous video generation variants been removed in the "Full Clip Edition"? That was one of my favourite features of the previous version. I did enjoy it but after a few hours of play it was really just the same experience over & over again (just in different locations within the game). Phew! Thanks.That was one of my favourite features of the previous … Phew! Thanks.That was one of my favourite features of the previous version.I did enjoy it but after a few hours of play it was really just the same experience over & over again (just in different locations within the game). Bulletstorm was one of those games that got lost in the mix for me back in 2011. Hopefully I'll finally get around to it with this remastered version, but I'm already behind on 2017 releases at it is! Another year I'm skipping COD. I actually did buy Infinite Warfare but only because of COD 4 remaster and hated Infinite warfare as much as anyone else for its far future space setting but I don't care about WW1 or WW2 games at all and even skipped BF1 completely because of its WW1 setting. I believe semi futuristic fps games like Titanfall 2, Black ops 2 and Black ops 3 are the perfect balance. I really hope Black ops 4 is semi futuristic or else I'm done with COD altogether. Another year I'm skipping COD. I actually did buy Infinite Warfare but … Another year I'm skipping COD. I actually did buy Infinite Warfare but only because of COD 4 remaster and hated Infinite warfare as much as anyone else for its far future space setting but I don't care about WW1 or WW2 games at all and even skipped BF1 completely because of its WW1 setting. I believe semi futuristic fps games like Titanfall 2, Black ops 2 and Black ops 3 are the perfect balance. I really hope Black ops 4 is semi futuristic or else I'm done with COD altogether. If it is true, it's no doubt in response to BF1 and the feedback that the community wants "boots on ground" again. I'll be interested to see how they manage to maintain the high-octane feel of the competitive multiplayer in the setting. As someone who was a huge fan of CoD 1 + 2 I'll be interested to see if Sledgehammer Games can pull it off. Some of you might want to prepare an apology note or two, because Football Manager 2017 is currently free to download and play. The free weekend access unlocks the entire game, with any progress transferable should you want to buy it later. It’s a move Sports Interactive and Sega have most likely taken to combat the Mostly Negative user reviews on Steam, hoping some new blood will enjoy the latest iteration of the long-running relationship killer. The Dark-Souls-inspired 2D RPG Salt & Sanctuary finally makes its way to the PlayStation Vita on March 28th. Best of all, developers Ska Studios have confirmed that it will be Cross Buy – so if you’ve already purchased it for PS4 you’ll be able to play it on the Sony handheld. Otherwise, it will cost £14.99 to play what has been regarded by critics as a well rounded homage to From Software’s SoulsBorne titles. Despite being one of the highest rated games of the year so far, the PC port of Nier: Automata has not been well received. This is because of numerous glitches, ranging from frequent frame rate drops to limited resolutions settings, regardless of how powerful the machine playing it may be. Thankfully, one modder has taken matters into their own hands. Steam user Kaldaien has created the Fix Automata Resolution mod which resolves most of these issues. Hopefully an official patch will be released soon, but in the meantime this is the best bet for PC players. The Capcom Fighters Network used to power the online functions of Street Fighter V will be seeing a number of changes from next week. It’s all to combat the connectivity issues that have plagued the game since launch, and to ensure nothing is overlooked Capcom are opening the beta up to everybody on Steam. All you need to do to take part is download the client, and while progress and stats will not carry over you will be able to play all of the playable characters – including Korin – for the duration of the test. In other words, this is a great opportunity to see if Street Fighter V is worth investing in whilst helping to make the game better. Despite a huge fanfare and high-profile promotion before launch, Nintendo have admitted that mobile title Super Mario Run has not performed as expected. In an interview with Nikkel, company president Tatsumi Kimishima stated that the overall revenue “didn’t meet our expectations,” no doubt a result of only 4 million out of the 78 million downloads resulting in a full-unlock purchase. It makes for an interesting read, especially as Kimishima confirms that Nintendo won’t be dropping the pay-once model despite the disappointment. The Battle.net App is dead – Long live the Blizzard Launcher! Having announced the change was coming last September, Blizzard Entertainment have finally re-branded the Battle.net App for their games. The new name? Blizzard. The move has been done to consolidate the brand under a single identity, and while the Battle.net website is still live and features all of that branding, we can expect this to change in the immediate future. In short, it might be the end of an era but it’s business as usual for the games. For the Horde and Alliance, the Broken Shores were merely a setback as Patch 7.2 launches next week, bringing the action back to where it started pre-expansion. The trailer shows the return of Kil’Jaeden, along with an armada of rather menacing floating battleships. It marks the beginning of the end of the latest expansion, although the raid into the Tomb of Sargeras won’t be available right away. With two weeks to go until the remastered version of Bulletstorm arrives, a new trailer has been released to showing the over-the-top FPS gameplay with the improved visuals. The Full Clip Edition comes with all of the DLC, and pre-orders can even replace the main character with a certain Duke Nukem, complete with voice acting from John St. John.